The U.S. meat industry employs a huge number of over 800,000 people and the number is still increasing with every year. If you are a marketer looking to target the meat packing industry, you are at the right place! Blue Mail Media’s Meat Packing Plants Email List includes companies in the business and trading of meat of cattle, hogs, sheep, lambs, and calves. The contact details in this database are highly accurate and updated using the anti-spam laws and other related regulations. You can also get this list customized as per the selects such as beef products, lamb products, canned meats, mutton packing plants, etc. Gathered from sourced contacts, this list comes with a guarantee of delivering high-level of response rates. Customized Data to Give you an Edge Over Competitors! If the meat packing industry is your next target market, make sure you have prepared well before soliciting any marketing campaign for the same. By preparation, we mean ‘data’ – data that is accurate, verified, and updated using the latest and cutting-edge resources. Blue Mail Media can help you in your preparation! 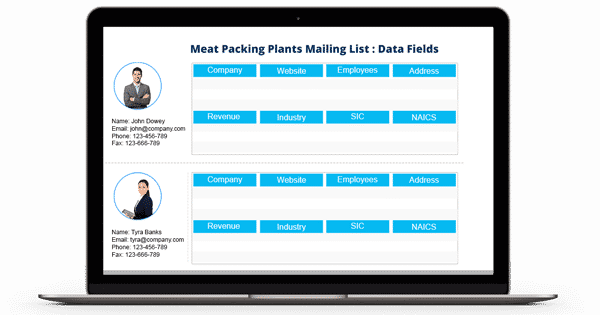 Our Meat Packing Plants Email Database gives you access to reach your most significant prospects from the meat packing plants spread across the globe. This list is a highly segmented database that aims to deliver the best of results for your multi-channel marketing campaigns. We offer mailing list with various customization options such as bacon mailing list, corned beef email database, poultry email list, and so on.